New novella “Franklin Loves Lucy” for sale at Audible! 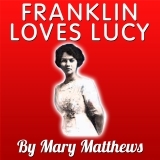 Franklin Loves Lucy by Mary Matthews is Lee Ann’s latest recording to be released on Audible. Written as a historical romance, Mary Matthews tells the story of the romance between Lucy Mercer and Franklin Delano Roosevelt from Lucy’s perspective. Lucy Mercer fell on hard times when her family lost their money. She took a job as Eleanor Roosevelt’s social secretary. Franklin Loves Lucy is the story of a relationship that began when Franklin Roosevelt was Assistant Secretary of the Navy and ended when he was President and took his last breath with Lucy by his side. This novella may be purchased here. Posted by lahowlett on October 21, 2013 in Uncategorized and tagged Audible, audiobook, Franklin D. Roosevelt, historical romance, Lee Ann Howlett, Literature, Lucy Mercer, Lucy Page Mercer Rutherfurd, Mary Matthews, novella.